Side note: There was talk of SAP HANA, Hadoop, & Pivotal. The place that I typically play in is Storage and not that space, so I’m going to ignore their emphasis there. 3rd Platform — This is at least the 2nd year that EMCWorld has had mention of this and I really like the tie into the concepts from the Innovator’s Dilemna i.e. that there are technology waves and that mobile users and devices are the 3rd wave of consumers, following the 2nd wave, PC users, and 1st wave mainframes. Emphasis on this, in my opinion is a strength. 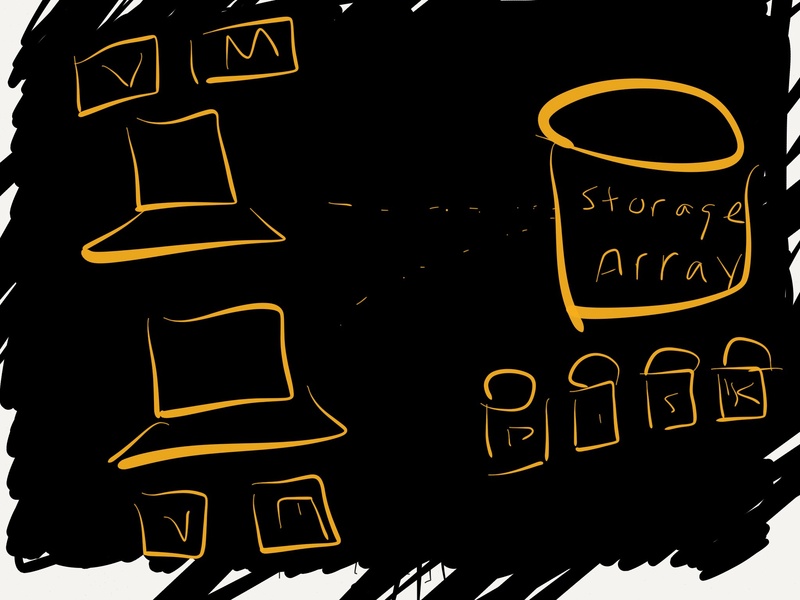 ViPR (&VMAXce) — Lots of talk about ViPR 2.0 their abstraction layer & coding into storage. One of my unknowns was how does EMC ViPR compare with VMware Orchestrator. Turns out, ViPR needs to talk northbound into the VMware layer or OpenStack Layer while VMware Orchestrator would need to talk southbound to ViPR or directly to arrays. Last year, there were lots of mentions of VMAXce, this year I didn’t hear anything. So, VMAXce makes it easier to provision on predetermined tiers and such (Cloud provisioning portal, etc). If EMC struggled getting that right, how will smaller firms deal with their own coding to do ViPR? Electricity model for storage models (Utility model) — Dovetailing to the above, one presenter made analogies to the Electricity model. Right now, it is a utility 110/220V. Whereas before AC was standard, companies needed their own electricity generation (Singer sewing machines as an example). So, if the future is to scale, we need less complexity and thus, fewer options. This ties back to ViPR and also ties into performance based criteria to storage, not just capacity. Redundancy & Data Protection would be considered as givens. But, as we can see from #2, it doesn’t appear as simple as it sounds. Just like school — Spoke to one new attendee to EMCworld and he compared it to school — racing between classes, information overload. I think one can add parties at night, concert midweek, sleep or bail on the last day of the week (attendance at breakfast this AM was lower and projected to be so). Las Vegas Venetian / Sand Convention Center — Every year, I’m blown away with the logistics of feeding 15,000 people for breakfast and lunch. Herd everyone in for breakfast, clean up, truck the stuff out, truck the lunch stuff in, prep the buffet tables, replace table cloths and herd the lunch crowd in. Very impressive. (I said in #4 that breakfast this AM, following last night’s concert, was projected to be less — they cut the dining area in half it appeared). VMware — I always find it interesting that at EMCworld, EMC touts VMware as an integral part of their company (I think they own 80%). When you talk to VMware staff, they sound independent — as they wish to be storage agnostic. However, it seems that the cultural differences between the two and other barriers are coming down a bit more. Seems that VMware is really more a part of EMC than they used to be. Backups — During one of the backup presentations, there was a nice slide on the data protection spectrum. Continuous Availability (immediate w/ VPlex), Replication (seconds, w/RPAs), Snapshots (minutes, w/array based), Backups (hours w/Avamar or Networker), Archive (days w/Atmos). Seeing with those point solutions added clarity. Other folks in town — While EMCWorld was at the Venetian, I saw that NetApp was at the Aria & I heard that Symantec was at Caesar’s Palace. I guess the week in Vegas was a temporary tech conference. How to deal with exponential growth rates? And how does this relate to cloud computing? What happens when demand exceed the resources? Ah, raise prices. But, sometimes that is a not available as a solution. And sometimes demand spikes far more than expected. Example: Back in the early 2000s, NetFlix allowed renters to have 3 DVDs at a time, but some customers churned those 3 DVDs more frequently than average and more frequently than Netflix expected. So, they throttled those customers and put them at the back the line. (dug up this reference). This also appears to have happened in their streaming business. Another example: Your web site gets linked on a site that generates a ton of traffic (I should be so lucky). This piece says that the Drudge Report sent 30-50,000 hits per hour bringing down the US Senate’s web site. At 36,000, that is an average of 10 per second. Network Bandwidth tends to be the resource. Another example from AT&T: As a service provider, this piece says that 2% of their customers consume 20% of their network. There are non-technical examples as well. The all-you-can-eat buffet is one. Some customers will consume significantly more than the average. (Unfortunately, I can’t find a youtube link to a commercial that VISA ran during the Olympics in the 80s or 90s where a sumo wrestler walks into a buffet – if you can find it for me, please reply). How does this deal with computing? Well, quotas are an example. I used to run systems with home directory quotas. If I had 100GB, but 1000 users, I couldn’t divide this up evenly. I had about 500 users who didn’t need 1MB, but I had 5 that needed 10GB. For the 500 users that did need more than 1MB, they needed more than an even slice. So, the disk space had to be “oversubscribed”. I then could have a situation where everyone stayed under quota, but I could still run out of disk space. Banks do this all the time. They have far less cash on-hand in the bank, than they have deposits. Banks compensate by having insurance through the Fed which should prevent a run on the bank. In computing, this happens on network bandwidth, disk space, and compute power. At deeper levels, this deals with IO. As CPUs get faster, disks become the bottleneck and not everyone can afford solid state disks to keep up with the IO demand. The demand in a cloud computing environment would hopefully follow a normal distribution (bell curve) for demand. But, that is not what always occurs. Demand tends to follow an exponential curve. As a result, if the demand cannot be quenched by price increases, then throttling must be implemented to prevent full consumption of the resources. There are many algorithms to choose from when looking at the network, likewise there are algorithms for the compute. Given cloud architecture which is VM on a host connected to a switch connected to storage which has a disk pool of some sort, there are many places to introduce throttles. In the image below which is uses a VMware & NetApp vFiler environment (could be SVM aka vServer as well) serving, there is VM on ESX host, connected to Ethernet switch, connected to Filer, split between disk aggregate and a vFiler which then pulls from the volume sitting on the aggregate, and then has the file. Throttling at the switch may not do much good. As this would throttle all VMs on an ESX host or if not filtering by IP, all ESX hosts. Throttling at the ESX server layer again, affects multiple VMs. Imagine a single customer on 1 or many VMs. Likewise, filtering at the storage layer, specifically, the vFiler may impact multiple VMs. The logical thing to do for greatest granularity would be to throttle at the VM or vmdk level. Basically, throttle at the end-points. Since a VM could have multiple vmdks, it is probably best to throttle at the VM level. (NetApp Clustered OnTap 8.2 would allow for throttles at the file level). Not to favor NetApp, other vendors (e.g EMC, SolidFire) who are introducing QoS are doing these at the LUN layer (they tend to be block vendors). For manual throttling, some isolate the workloads to specific equipment – this could be compute, network, or disk. When I used to work at the University of CA, Irvine and we saw the dorms coming online with Ethernet to the rooms, I joked that we should drive their traffic through our slowest routers as we feared they would bury the core network. It is important that the executives of a company know who they are and that it can be easily consumed by the employees. This allows everyone to know who they are and can be aligned on company direction. He stated what NetApp is as a company. He continued on what is important to the company to drive stock price. On top of that, stated what is important to NetApp’s customers. Then, identified what was required by NetApp to meet those needs. What was great about this speech, is that employees and partners heard – who they are, what their customers need, how they are going to meet those needs, and how that will drive stock price. The speech heavy with detail, reinforced the points above and potentially overshadowed those key points- but the simplicity of those points was key.